The Queen of the Jungle is having a jungle soiree and has personally invited you to join in on all the fun. Click here to play! Celebrate with this crazy queen and you could leave with a pocket full of green. Mingling is the name of this game, so start spinning the reels to meet all of the guests, including the queen herself. Spin in three or more of this striking royal beauty and you’ll pick up a payout worth up to 1,500 times your line bet. There’s also a hunky Tarzan type that will payout up to 1,000 times your line bet if you happen to say hello. Also keep your eyes out for refreshments and monkeys. The fruit will payout up to 750 times your line bet, while the latter will trigger a second screen bonus game in which you could win even more in cash prizes. There’s also a potent coconut cocktail that ensures a fantastic time. Three or more of these drinks will not only multiply your total bet, but they will also trigger a number of free spins. 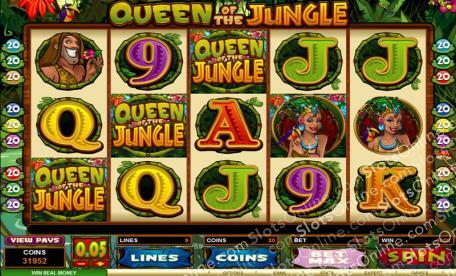 So, party it up as the queen’s personal guest in this jungle themed slot and you could end up winning quite a bit of cash. The coconut passionfruit juice is a scatter symbol. Spin two or more anywhere on the board to multiply your total bet by 1, 2, 20, or 200 respectively. Three or more of these sweet drinks will trigger up to 15 free spins in which all wins are tripled. The Queen of the Jungle logo is a substitute. It will replace all others, excluding scatters and bonuses, to help you bring in more wins. It will also payout up to 3000 times your line bet if you can spin three or more across an active payline. The cheeky monkeys are a bonus symbol. Spin three or more of these fury friends anywhere on the board to trigger the Monkey Bonus Round. You'll get to choose from three different games in which you could win up to 127x your total bet. The monkey symbol will also multiply your total bet if you can line up two or more across an active payline.